Ahoy there, mateys! Today is a little bit of a different kind of post than what’s usually up here at MBIP. Today, I’m going to be asking for your help with something I’m trying to do. Let me explain. And now this is where you, the wonderful and loyal MBIP audience come into play. I need all of you to help me find these kids. I’d love to get them all together for a picture and find out what happened to them. Here’s what you can do, put the picture below on your facecrack and Twitter pages (if you don’t know how to copy it, send me an email and I’ll email you the jpg) and ask if anyone knows who and where these kids are today. Use the hashtag, #CaptainsKids and let’s see if we can find them. If you have a blog and want to put up a post and be part of this, feel free! Since we’re on the subject of Captain Jinks and Salty Sam, I bought a DVD last year of a special that channel 25 did on the show last year. I thought I’d put up some stills from that to round out today’s post. Okay, mateys, let’s take a trip on the SS Albatross! Here's the DVD, it was a special hosted by Tom McIntyre. Let's put it in the MBIP computer and take a trip to the past. 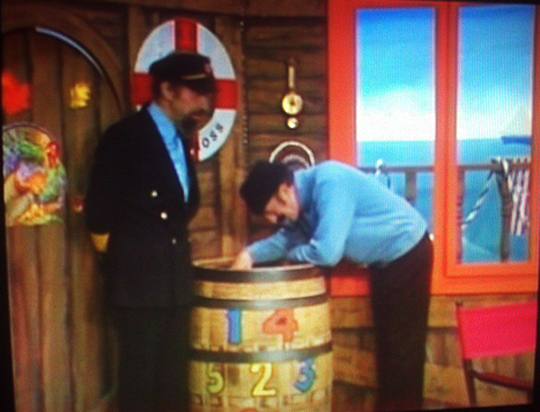 And awaaay we go aboard the SS Albatross into the high and sometimes 100 proof waters of Captain Jinks and Salty Sam. Here's a promo shot of the Captain and his first mate, Salty Sam. Salty dives into the Joke Barrel, which was filled with postcards of jokes sent in from kids that watched the show. Lots of bad jokes and puns inhabited that barrel! This was the address for the Joke Barrel, I need to go there and do one of my, "This Used To Be," segments. Stay tuned for that! Here's some artwork sent in by fans of the show. I sent in a picture once and they never put it up. I'm shattered and scarred by that to this day. Sob! 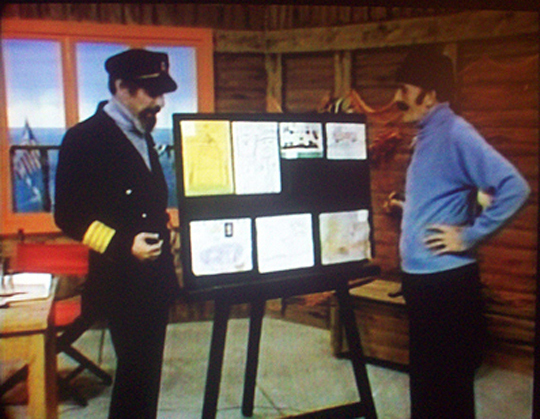 Speaking of art, Captain Jinks had their own in-house artist, Bosun Joe. And here he is in action, all those years ago. Here's Bosun Joe today. He says that he still gets recognized and asked about what it was like to be on the Captain Jinks show to this day. He's still an artist, check out his website. Chery Corley was the director of the Captain Jinks show and she said both Stan Lonergan, who played Captain Jinks and George Baseleon who was Salty Sam were very sincere and genuine when it came to the show. Here's the Captain interviewing a miniature Matey from the in-house audience. 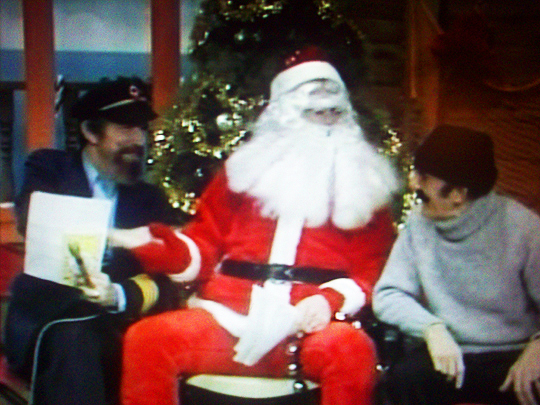 The Captain and Salty are here at a telethon with, Jim Maloof who would go on to be the Mayor of Peoria. 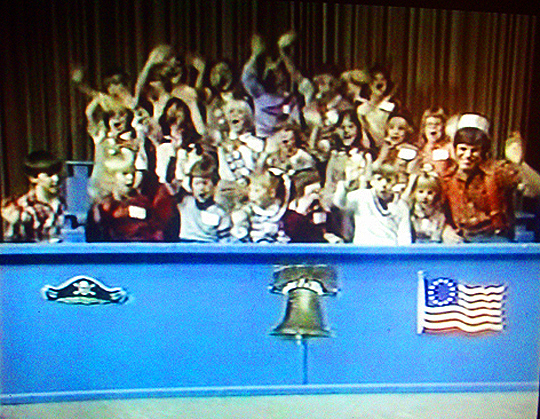 And here they are on the same telethon with Vic Burnett, the weatherman that changed my life! 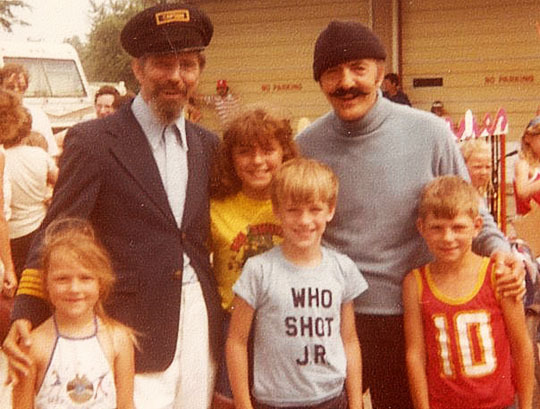 #CaptainsKids Let's find these kids and see what happened to them after this picture was shot. I'll be obsessed with this until we find them, so please help me make this holiday miracle happen! Thanks, Mateys! Related Posts: Peoria, I Hardly Knew Ye and Peoria TV Rerun: The Acri Creature Feature. All of the places she might be. Maybe I stopped her from being free. Maybe there was something missing in me.